Chocolate covered strawberries are fast becoming a Valentine’s Day tradition. Have you ever thought to yourself though that it’s a little strange how fresh strawberries are so readily available in the dead of winter? Well your concerns are warranted, because strawberries being produced year round is only done so with the use of chemicals, often toxic chemicals. 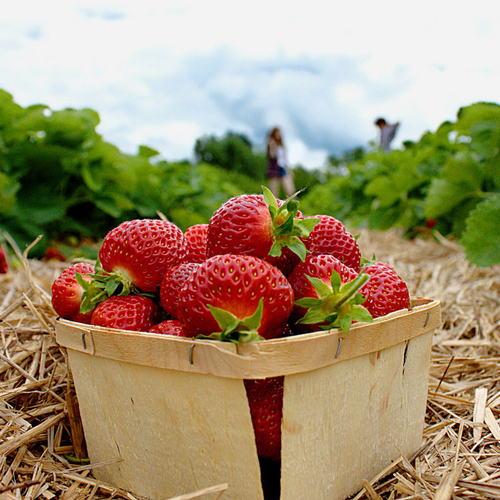 While strawberries are grown from January – November, the typical growing season is from April through June. That’s three months. So if you’re purchasing “fresh” strawberries in February for your loved one, the ideal month for them to have been grown was eight months prior. Now that’s not to say strawberries cannot be grown after June, but typically if it’s done so it’s done using harmful chemicals. To ensure that strawberries can be produced 10-11 months out of the year, farmers rely on “pre-plant chemical fumigants. Growers hire pest control companies to fumigate soils before planting strawberries in order to kill soil-borne pests—most importantly, plant pathogens such as Verticillium dahliae and Macrophomina phaseolina.” If the soil was to be left untreated though, the strawberries wouldn’t survive. So what’s the answer? Well some farmers are taking steps to produce strawberries nearly year ‘round without the use of fumigants. Unfortunately, the farmers use “starter plants produced on fumigated soil, since no nurseries produce organic plants.” It seems as though with many instances, there’s no easy answer. If fumigants were to be completely outlawed, it would be a positive step in ensure your strawberries and other fruits were safe to eat. However, without the ability to grow strawberries year ‘round, the amount produced would of course decrease greatly, and prices would rise drastically. A solution that's good for both consumers and farmers is deperately needed. Here's to hoping we find one soon.